Do you love animals? Are you looking for a way to add more meaning to your life? Would you like to live in a community that cares for all of it’s animals? 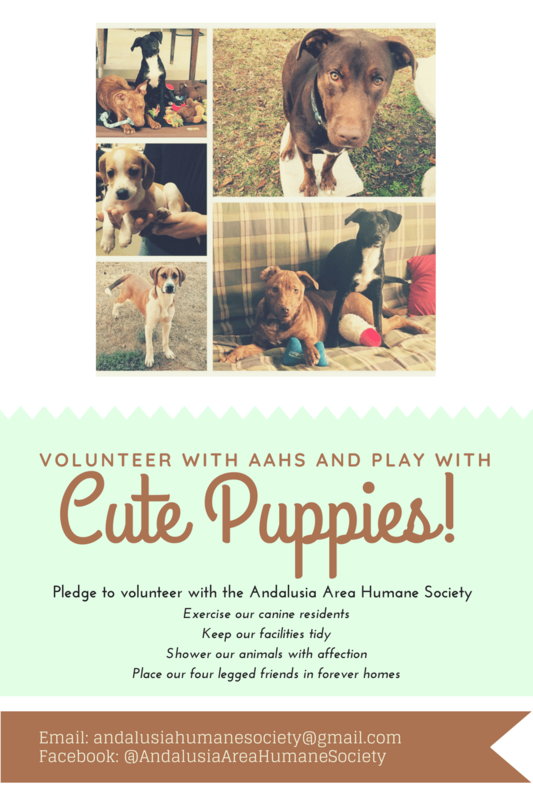 If so, we may have just what you’re looking for as a volunteer with us at the Andalusia Area Humane Society. We are building a core group of capable, mature, and dependable volunteers to assist in the the day-to-day operation of our facility and help us fulfill our mission. Our greatest asset is the dedication and compassion of our volunteers. Our ability to save lives is directly tied to the number of volunteers we have at any given moment. If you want to help ‘at risk’ animals in Covington County, please complete and submit our Volunteer Application today!